Chris Paul held his emotions about departing from the Los Angeles Clippers after six seasons in check. Well, that was until he broke the news to his 8-year-old son, Chris Paul II. That’s when reality hit. Lob City was over. Goodbyes needed to be said in his beloved Los Angeles. An ultracompetitive Paul’s thirst for winning led him to try something new in Houston by joining fellow NBA All-Star James Harden and the much-improved Rockets. “The funniest person I had to tell about it was my daughter,” Paul told The Undefeated. “When I told her, she just looked at me and said, ‘Is Mommy coming?’ That’s the rawness of kids. My daughter is 4, and she don’t care where we go, she just wants her mommy there. 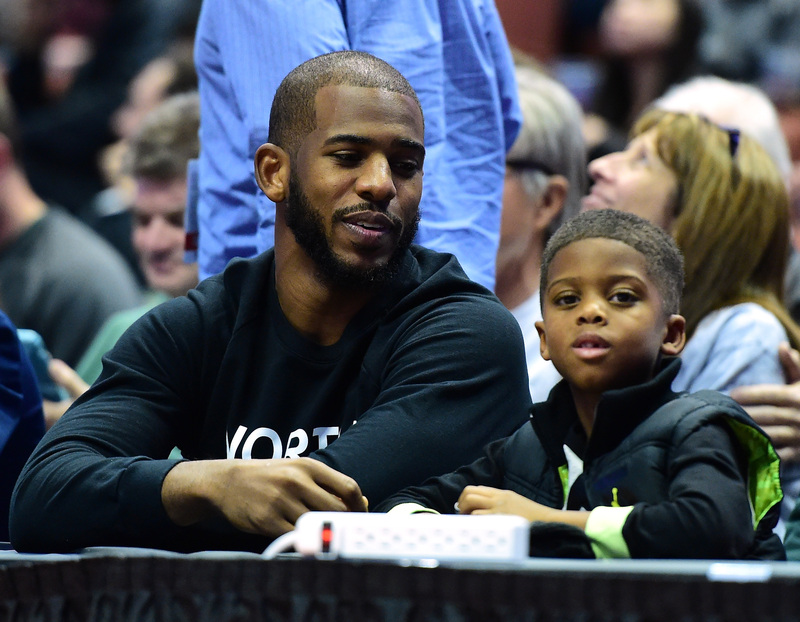 Chris Paul of the Los Angeles Clippers and his son Chris watch the game between the Michigan State Spartans and the Providence Friars during the championship game of the DirecTV Wooden Legacy at Honda Center on November 29, 2015 in Anaheim, California. In an exclusive interview with The Undefeated on Monday night, Paul spoke publicly for the first time about his decision to leave the Clippers for the Rockets. The nine-time NBA All-Star said it was best for him and the Clippers to move on after six seasons that did not include a Western Conference finals appearance. Now in his prime at 32 years old, Paul believes he can finally quench his thirst for victory in Houston and has no regrets. “It had nothing to do with who was in L.A., but more to do with who was in Houston,” Paul said. Paul spoke in-depth about life on and off the court with the Clippers, saying goodbye to L.A. and hello to a town he doesn’t know well in Houston, his love for his supportive wife, Jada, his hopes of playing with his buddy Carmelo Anthony in Houston, and more. How did you come to the decision to make a change to the Rockets? For me, first of all, I love the Clippers and the organization. [Owner] Steve Ballmer has been unbelievable. The relationship I made with him over the last few years is something that won’t go anywhere. I’m grateful, thankful and so blessed. I feel like I’m leaving Los Angeles with nothing but love. So why leave the Clippers? I feel like the last six years we’ve had a great run. I felt like it was not only a good time for change for me, but for the team, too. Everyone says, ‘We get killed. We can’t get there. We just can’t get over the hurdle.’ I felt like it was time for change. How do you look back on your franchise-altering time with the Clippers? Do you see yourself getting your jersey retired there one day? That is up to the organization and how they feel. I got an opportunity to grow here. It’s unreal to think about the times that we had. … We had some good runs. Did you reach out to former Clippers teammates Blake Griffin and DeAndre Jordan about your decision? Absolutely, I reached out to D.J. and Blake and talked to some of those guys. Jamal Crawford, some of those guys. One of the people I reached out to and talked to was [actor/Clippers fan] Billy Crystal. You have different people that come to support you night in and night out. Joe and Sharon Hernandez, I used to give them dap before every game. A guy named Steve Soboroff, who sits courtside. And just these fans. There are fans in this Section 114. They got tattoos a few years ago that said 114. I wanted to reach out and say, ‘Thank you for the last six years.’ I just wanted to let them know their genuine kindness and support did not go unnoticed. How did you tell Clippers coach and president Doc Rivers you wanted to be traded to the Rockets? I don’t think we need to get into all that stuff. We met. We talked. We both agreed it was time for a change. Were you surprised the Clippers wanted change? Surprised? I don’t think so. Both teams were able to get something out of it. Did you want to help the Clippers get something in return for you? Absolutely. The organization has been nothing but great to me. My relationship with Ballmer has been unbelievable. No question. What can you say about your relationship with Coach Rivers? Doc was an unbelievable coach the past four years with the things I got a chance to learn and hear. I always say that my late [Wake Forest] coach Skip Prosser had so many different things he would say. He would say, ‘Never delay gratitude. … If you can’t be on time, be early.’ All that good stuff. There are certain things that Doc has said the past four years, where when I find myself with my AAU team or kids, I say. I say all the same stuff. I’m grateful for the past four years. But not only Doc; [assistant coach] Armond Hill was someone I got really close with. I’m going to miss those guys. Our athletic trainer, Jasen Powell, became like family to me. My teammates. I’m going to miss them. Rivers recently told The Undefeated that he didn’t always see eye to eye with you, but he always respected you. What do you think of those words? Absolutely. I feel like in any relationship whoever it is … hell, me and my brother [C.J.] don’t always see eye to eye. But I always have the ultimate respect for [Rivers], and I’m grateful for the last four years. What will you miss the most about the end of “Lob City”? It’s crazy to look back at the videos of us six years ago. No one ever saw anything like that. I’m going to miss those guys. When you’re together that long, you’re more than teammates. Did you feel when you walked off the floor after losing a deciding Game 7 of a first-round series against the Utah Jazz that you had played your last game with the Clippers? No. No. I know we lost Game 7. I didn’t know. I didn’t think about it. I don’t even operate like that. I’m all about that moment. I’m trying to figure out why we lost and what I could do to help us win. I didn’t know that was my last time. Just like I called Blake and those guys, I called Austin. I wish him the best of luck with what he has going on in the future. … No, that report wasn’t true. If anything, Austin has grown up a lot and is getting better. I heard the report. It’s not worth responding to. What influence did Rockets All-Star James Harden and your former New Orleans Hornets teammates Trevor Ariza and Bobby Brown, both with the Rockets now, have on your decision? They had somewhat of a role. Obviously, the relationship with Bobby and Trevor … [Ariza and I] had one season in New Orleans where we got close. Bobby did the same thing. It’s basketball, too. I don’t know if it was just watching and seeing them play. What was James’ influence on your decision? Just how excited he would be about the opportunity. It showed a lot of selflessness. The fact that it’s all about winning. We talked, obviously, he had a great year last year. Everything was about winning games. … He just said he wants to win. Are you guys co-point guards? How do you make it work? How do two All-Stars so great with the ball make it work together? I don’t know. You just do it. You just find a way. The San Antonio Spurs reportedly were high on your list of prospective teams. What can you say about your interest in the Spurs? I wouldn’t even know what to say. The Spurs are the Spurs. How good do you think the Rockets can be? That’s completely up to us. I’m excited about getting there and getting integrated into the city. It’s an exciting time. You have played an instrumental role in mentoring and giving to the Brotherhood Crusade, which has served people of color in L.A. for almost 50 years. You furnished the computer room and donated computers through your charity foundation. You also received the 2016 Brotherhood Crusade’s Pioneer of African-American Achievement award. When you visit, as scheduled, with those kids on Tuesday, what are you going to say? Tough, man. When things like this happen and change … I’m actually a person that is not big on change. I’m all about my family and things like that. And when you make decisions like this, you start to realize that it not only impacts you and your family but also these kids that you have gotten close to. I spent time here in L.A. with the Brotherhood Crusade, which I’ve done different events and worked with. It’s one thing to explain things to adults who understand the business. But sometimes kids don’t understand when this stuff happens. For me, it’s about going over there and talking to them and letting them know that the work that we’ve started and that we’ve been doing, just because I’m changing addresses to play basketball, my love and support for them don’t change. What do those kids mean to you? I tell them all the time that I enjoy spending time with them, hearing their stories and talking to them about life. They enjoyed me coming by and seeing them. Just like this other group, L.A.’s Best, this group of kids we always work with, what they give to me is honesty. That is one of the biggest things that kids give you. They are unfiltered. If I see them after we had a tough game, they are going to let me know. They’re going to be like, ‘Why y’all lose to them, man? Why did you do this? Why did you do that?’ When we showed them the new computer lab and the computers that we gave them … they immediately go to the internet and go to YouTube, Googling things. They are quick to show me an air ball that I missed. It’s the genuineness of some of the kids I appreciate. How would you describe your time in Los Angeles? Oh, my goodness. I’m going to miss so much. Other than North Carolina, this has become home for me and my family. For my kids, this is all they’ve really known. The community and the people. My neighborhoods. My friends. My kid’s friends that they went to school with. And Clippers fans have been not only amazing to me but unbelievable to my family. Me and my crew, when we come somewhere, it’s not just me. This is all my kids have pretty much known. My son is 8, and we’ve been here for six years. We really have come to know a lot of different people who were friends and family now. A lot of people in the Clippers organization have become family to us. What do you know about Houston, and what are your plans there off the court? My wife is the one. No support system, no rock like her. My wife is the one trying to make these tough decisions. She gets it. She knows how much I love this game and how competitive I am. This whole thing is about competition. I’m the most competitive person I know. For me, it’s all about having the best opportunity at having a shot at one of those rings. I’m not built for [losing]. I won’t settle for less. And she knows that. The 25th ESPY Awards return to Los Angeles on Wednesday. At last year’s ESPYS, you, LeBron James, Carmelo Anthony and Dwyane Wade gave a surprise social conscience speech that centered around the need for gun violence and police brutality to stop. What do you recall about that speech? When are you going to Houston? I got AAU tournaments going on with my young kids. My wife has been down there trying to find a house. But as soon as possible we want to get there so we can figure out school for the kids and stuff like that. Any calls or texts from other NBA players that stood out after you chose Houston? ’Bron [James], Melo [Anthony] and D [Wade] obviously hit me about how happy they were for me. Guys like Rudy Gay, Jarrett Jack reached out. I’ve talked to D.J. [Jordan] a lot. That means a lot. He’s from Houston. What can you say about Melo possibly being a teammate if the New York Knicks trade him to Houston or make him a free agent by buying him out? Man, sit back and wait.